Background: Phosphate binders are widely used to achieve serum phosphorus control in patients with end-stage renal disease. However, the large pill burden associated with these medications may decrease adherence to therapy. In clinical trials, sucroferric oxyhydroxide (SO) demonstrated equivalent control of serum phosphorus to sevelamer, with a lower daily pill burden. We examined changes in phosphate binder pill burden, medication possession ratio (MPR), and phosphorus control among in-center hemodialysis (ICHD) patients converting to SO from another phosphate binder as part of routine care. Materials and methods: Patients included in this retrospective analysis (N=490) were ≥18 years old, received ICHD at a large dialysis organization (LDO), and were enrolled in the LDO’s pharmacy service. Patients converting to SO were those who had supply of another phosphate binder, received a first prescription fill for SO, and subsequently did not refill the non-SO phosphate binder. Patients were followed over the 6 months before and 6 months following the first SO fill and were censored from the analysis upon modality change, loss to follow-up, discontinuation of SO, or fill of a prescription for another phosphate binder after SO initiation (number censored=361). Outcome measures assessed were total phosphate binder pill burden and MPR, serum phosphorus, and percentage of patients with serum phosphorus ≤5.5 mg/dL. 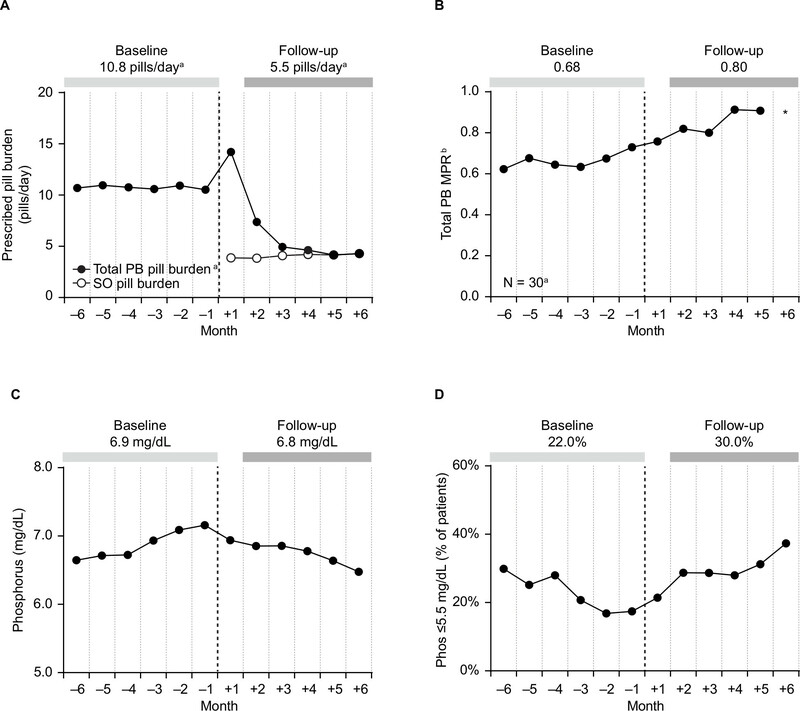 Results: Among patients converting to SO, mean phosphate binder pill burden was 10.8 pills/day during baseline; this decreased to 5.5 pills/day during follow-up (P<0.001). The percentage of patients with serum phosphorus ≤5.5 mg/dL increased from 22.0% to 30.0% (P<0.001). Among patients not using the LDO pharmacy’s automated refill management service (N=30), mean phosphate binder MPR increased from 0.68 during baseline to 0.80 during follow-up (P=0.01). Conclusion: In a cohort of ICHD patients, conversion to SO was associated with a reduction in pill burden, better adherence, and improvements in phosphorus control. Sucroferric oxyhydroxide (SO, Velphoro®, Fresenius Medical Care Renal Therapies Group, Waltham, MA, USA) is an iron-based phosphate binder indicated for the treatment of hyperphosphatemia in patients with chronic kidney disease on dialysis. In Phase III clinical trials, SO was demonstrated to be noninferior to sevelamer with respect to serum phosphorus control and to have a lower daily pill burden.10,11 In this study, we sought to assess the impact of conversion to SO monotherapy from another phosphate binder on total phosphate binder pill burden, adherence, and measures of phosphorus control in a real-world cohort of in-center hemodialysis (ICHD) patients. Data for this retrospective study were derived from the electronic health records of a large dialysis organization (LDO; DaVita Inc) and prescription records from the LDO’s pharmacy service. Patients eligible for inclusion in the study were those who received ICHD at the LDO, were ≥18 years old, were not Veterans Affairs beneficiaries, and were enrolled in the LDO’s pharmacy service for at least 180 days prior to receipt of a first prescription fill for SO. The study considered patients who converted to SO use (as monotherapy) from another phosphate binder: such patients were defined from LDO pharmacy prescription fill data as those who had an active prescription for a non-SO phosphate binder within the 14 days prior to SO initiation, but who subsequently did not refill the prescription for the non-SO binder. This study was conducted using deidentified patient data collected during the course of routine care; therefore, according to title 45, part 46 of the US Department of Health and Human Services’ Code of Federal Regulations, this study was deemed exempt from institutional review board (IRB) or ethics committee approval (Quorum IRB, Seattle, WA, USA). We adhered to the Declaration of Helsinki and informed consent was not required. Patients considered were those who received a first prescription fill for SO between April 2014 and September 2016. Patients contributed up to 12 months of data to the analysis during two time periods: 6 months leading up to SO initiation (baseline) and 6 months following SO initiation (follow-up) (Figure 1). Analyses were performed following as-treated principles: following SO initiation, patients were censored from the analysis at the time of loss to follow-up (upon death, transfer of care, transplant, withdrawal from dialysis, or disenrollment from the LDO pharmacy benefits service); at the beginning of a month in which a change in dialysis modality was observed; and at the beginning of a month in which SO was discontinued or the patient received a prescription fill for a non-SO phosphate binder. Primary outcomes assessed were total daily phosphate binder pill burden, total phosphate binder medication possession ratio (MPR), serum phosphorus, and percentage of patients with serum phosphorus ≤5.5 mg/dL. Phosphate binder pill burden was defined as the total number of prescribed pills per day among users. For any given interval, MPR was calculated as the number of days for which there was active binder supply (if used as prescribed) divided by the number of days in the interval. MPR was considered only for the subset of patients not enrolled in the LDO pharmacy’s automated refill management service. Additional outcomes considered were serum calcium, parathyroid hormone (PTH), utilization of cinacalcet and intravenous (IV) vitamin D, and serum ferritin. Characteristics of patients converting to SO use are reported at the time of SO initiation as means, SDs, medians, IQRs, counts, and proportions, as dictated by data type. Monthly descriptive analyses of outcomes considered all available data; mean values are reported. Formal comparisons of outcomes over the baseline and follow-up periods were made using mixed linear models and excluded data from the month immediately following SO initiation (month +1), this to account for the situation where a patient may still have had a carryover supply of their prior phosphate binder; only those patients who remained in the analysis into the second month of SO use (month +2) were considered in these comparisons (Figure 1). Models contained a fixed-effect term representing the study period (baseline, follow-up) and a random-effect intercept representing the patient. The appropriate covariance structure was determined empirically based on model fit criteria. Models for continuous response variables were specified using a natural link and Gaussian distribution. Appropriate transformations were used to account for non-Gaussian distributions; in such instances, final estimates were back transformed and expressed on the native scale. Models for dichotomous response variables were specified using a logit link and a binomial distribution. Results are reported for the baseline and follow-up periods as modeled means (continuous variables) and modeled percentages (dichotomous variables) with 95% CIs. A total of 490 qualifying ICHD patients who converted to SO use from another phosphate binder between April 2014 and September 2016 were identified for inclusion in analyses. Characteristics of the cohort of SO converter patients are presented in Table 1. At the time of SO initiation, 66.3% of patients were prescribed sevelamer, 19.2% were prescribed calcium acetate, and 12.7% were prescribed lanthanum carbonate. Mean serum phosphorus at the time of SO initiation was 7.2 mg/dL, while 17.6% of patients had serum phosphorus ≤5.5 mg/dL. At the time of SO initiation, 89.4% of patients were receiving IV vitamin D, with a mean (SD) dose of 47 (40) µg/treatment. Patient censoring events over the 6 months following SO initiation are shown in Table S1: 199 patients (40.6%) discontinued SO, 128 patients (26.1%) initiated use of another phosphate binder after exhaustion of the initial first-line binder, and 31 (6.3%) were lost to follow-up (upon death, transfer of care, disenrollment from the LDO pharmacy service, transplant, or withdrawal from dialysis). Notes: Demographic variables and oral medication use are defined as of the date of SO initiation; dialysis treatment-related variables, laboratory values, and IV medication use are defined as of the dialysis treatment on or most recently preceding the date of SO initiation within 90 days. Abbreviations: BMI, body mass index; ESA, erythropoiesis-stimulating agent; ICHD, in-center hemodialysis; IV, intravenous; PTH, parathyroid hormone; SO, sucroferric oxyhydroxide; TSAT, transferrin saturation; nPCR, normalized protein catabolic rate; p25, 25th percentile; p75, 75th percentile. Mean monthly prescribed phosphate binder pill burden (Figure 2A) was calculated based on the total number of pills prescribed per day for all active phosphate binder prescriptions. The prescribed phosphate binder pill burden was essentially constant over the 6 months prior to SO initiation, at ~10.5 pills/day. In the month immediately following SO initiation, the total prescribed pill burden increased as the calculation of prescribed pill burden includes both the carryover non-SO phosphate binder as well as SO. This assumption and calculation does not necessarily reflect the number of pills actually taken by a patient each day (which cannot be determined from electronic health records): many patients may have stopped taking the non-SO binder upon filling the SO prescription. As the supply period for the carryover non-SO binder prescription expired over the early months of follow-up, the total prescribed phosphate binder pill burden declined, reaching a new constant of 4–5 pills/day during months +3 to +6. Comparison of total prescribed phosphate binder pill burden over the entire baseline period (months –6 to –1) vs follow-up (months +2 to +6) showed that the number of prescribed pills per day declined from 10.8 to 5.5 (P<0.001; Table 2). Figure 2 Longitudinal trends in total prescribed phosphate binder pill burden, medication possession ratio, and phosphorus control among ICHD patients converting to SO. Notes: Mean values in each month of study are plotted. aTotal monthly prescribed phosphate binder pill burden (A, closed circles) was calculated based on the total number of pills prescribed per day for all active phosphate binder prescriptions. In the month immediately following SO initiation, the total prescribed pill burden increased as the calculation of prescribed pill burden includes both the carryover non-SO phosphate binder as well as SO. This assumption and calculation does not necessarily reflect the number of pills actually taken by a patient each day. The pill burden for SO alone – ie, excluding the carryover non-SO phosphate binder – is also shown for reference (A, open circles; follow-up period only). bAnalysis of medication possession ratio (B) was limited to the subset of patients who were not enrolled in the LDO pharmacy refill management service (n=30). *Data point representing ≤10 patients is not plotted. Abbreviations: ICHD, in-center hemodialysis; LDO, large dialysis organization; PB, phosphate binder; SO, sucroferric oxyhydroxide. Notes: aMPR was considered only for the subset of patients not enrolled in the large dialysis organization pharmacy’s refill management service. Due to sparse data, models did not converge and comparisons of baseline to follow-up were made using paired t-tests. Abbreviations: ICHD, in-center hemodialysis; IV, intravenous; MBD, mineral and bone disorder; MPR, medication possession ratio; PB, phosphate binder; PTH, parathyroid hormone; nPCR, normalized protein catabolic rate; SO, sucroferric oxyhydroxide. Medication possession ratio represents the proportion of time that a patient has access to medication and is commonly used as a measure of adherence. MPR could only be assessed for the subset of patients who were not enrolled in the LDO pharmacy’s automated prescription refill service (N=30). Among these patients, mean total phosphate binder MPR rose over time (Figure 2B), increasing from 0.68 over the baseline period to 0.80 during follow-up (P=0.01; Table 2). Serum phosphorus increased slightly over the baseline period, from 6.6 mg/dL in month –6 to 7.2 mg/dL in month –1, but declined following SO initiation (Figure 2C). Mean serum phosphorus over the entire baseline period was 6.9 mg/dL, compared to 6.8 mg/dL during follow-up months +2 to +6 (P=0.02; Table 2). Accordingly, the percentage of patients with serum phosphorus ≤5.5 mg/dL increased from 22.0% during baseline to 30.0% during follow-up (P<0.001; Figure 2D and Table 2). 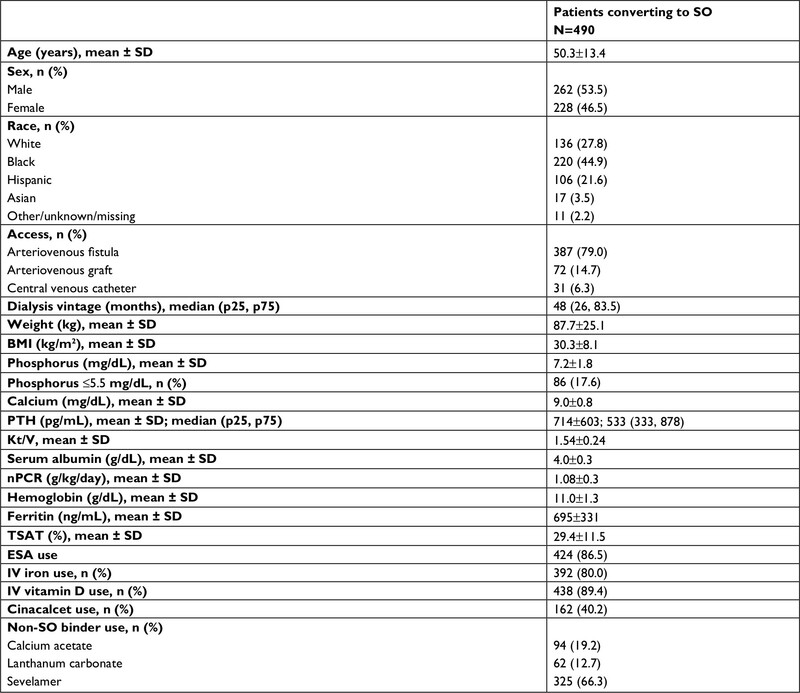 A secondary analysis of serum phosphorus control outcomes in which patients were censored from the analysis only upon loss to-follow up or change in dialysis modality revealed similar effects (Table S2). Mean serum calcium concentration was 9.0 mg/dL over baseline and 8.9 mg/dL over follow-up (P=0.20). PTH levels rose from 698 pg/mL over baseline to 764 pg/mL during follow-up (P=0.01). Correspondingly, utilization of cinacalcet increased slightly, from 24.6 to 27.2 mg/day (P=0.03), but no significant change in utilization of IV vitamin D was observed (P=0.50). Mean serum ferritin increased following conversion to SO (Table 2): from 721 ng/mL over the baseline period to 795 ng/mL during follow-up (P<0.001). However, among the subset of patients not receiving IV iron (n=42), no increase was observed (814 and 744 ng/mL for baseline and follow-up, respectively). No changes in measures of dialysis adequacy (Kt/V) or nutritional status (serum albumin and nPCR) were observed following conversion to SO (Table 2). In this retrospective analysis of a cohort of ICHD patients switching to SO use from another phosphate binder during the course of routine care, we observed a 49% decrease in phosphate binder pill burden and improvements in serum phosphorus control following conversion to SO. In the subset of patients who were not enrolled in the LDO pharmacy’s automated prescription refill service, phosphate binder MPR, a measure of adherence to therapy, increased following conversion to SO. Our findings are consistent with results of two recently published retrospective studies of SO use in the real-world setting: Coyne et al observed a drop in pill burden from 9.6 to 3.8 pills/day in an analysis of ICHD patients converting to SO use,12 while Kalantar-Zadeh et al reported a decline from 10.0 to 4.3 pills/day in a cohort of peritoneal dialysis patients initiating SO.13 The lower pill burden associated with SO was also evident in Phase III clinical trials comparing SO to sevelamer.10 Moreover, data from a 28-week Phase III extension study showed that adherence to therapy was higher for patients on SO than for those on sevelamer (86.2% vs 76.9%).11 However, assessment of adherence in the clinical trial setting is complicated by the fact that patient behavior is likely to be affected by study participation. To our knowledge, our study is the first to provide evidence from real-world practice that the lower pill burden associated with SO compared to other phosphate binders may result in better adherence to therapy. However, these findings should be interpreted with some caution as our assessment of adherence was limited to only a small subset of patients. In evaluating the effects of conversion to SO on serum phosphorus control, it should be noted that the patients included in this analysis were identified from among the first 2,500 patients to receive a prescription fill for SO through the LDO’s pharmacy service following the drug’s launch in the United States in 2014. It is often the case that a new drug in a particular class will initially be prescribed predominantly to patients whose symptoms are not well-controlled or who do not tolerate their current therapy; thus, patients receiving the drug in the immediate postlaunch period may not be representative of the broader target population. Among the patients considered in our analysis, mean serum phosphorus at the time of SO initiation was 7.2 mg/dL, considerably higher than the reported mean for ICHD patients in the United States overall,14 suggesting that physicians may have prescribed SO for patients with hyperphosphatemia that was refractory to current therapy. Despite this, we observed a modest reduction in mean serum phosphorus and a 36% increase in the percentage of patients with serum phosphorus ≤5.5 mg/dL upon conversion to SO use. There was a statistically significant increase in PTH levels following conversion to SO and a corresponding increase in the utilization of cinacalcet, likely reflecting the progression of secondary hyperparathyroidism in these patients. Iron overload in dialysis patients has been the subject of concern over recent years.15 SO is an iron-containing compound and might therefore be expected to contribute to the elevation of iron stores among patients taking it regularly. Although we did observe an increase in mean serum ferritin following conversion to SO use, this increase was not evident when analyses were restricted to patients who were not receiving IV iron. Although the number of patients not receiving IV iron in this study was comparatively small (n=42), our results suggest that absorption of iron from SO may not be the primary cause of increased serum ferritin. Our study has several limitations inherent to its design. This was a retrospective analysis based on electronic health record data that were collected during the course of routine patient care, not for research purposes. As such, information on pill burden and adherence was derived from prescription fill data; the number of phosphate binder pills actually taken by individual patients was not assessed directly. Moreover, assessment of MPR could only be undertaken in the small subset of patients who were not enrolled in the LDO pharmacy’s refill management service; findings should be validated in a larger cohort of patients. Reasons for SO initiation and discontinuation were not available in the source data and are not examined here; further studies examining reasons for discontinuation would be informative. Finally, study follow-up was relatively short in duration (6 months) and the lack of a control group means that contemporaneous changes that may have affected clinical outcomes were not accounted for in the analysis. In summary, the results from this retrospective study of a cohort of ICHD patients demonstrate that switching to SO monotherapy from another phosphate binder was associated with lower binder pill burden and improvements in serum phosphorus control. Analyses of medication possession ratio in a subset of these patients suggest that this may be the result of better adherence to therapy. This study was conducted using deidentified patient data collected during the course of routine care; therefore, according to title 45, part 46 of the US Department of Health and Human Services’ Code of Federal Regulations, this study was deemed exempt from institutional review board or ethics committee approval. We adhered to the Declaration of Helsinki; informed consent was not required. Fresenius Medical Care Renal Therapies Group provided funding for this study and is the distributor in the United States of the drug that is the subject of the research. Results from this study were presented in abstract form at the American Society of Nephrology Kidney Week Meeting in New Orleans, LA in November 2017. KG, AEH, and SMB are employees of DaVita Clinical Research. SMB’s spouse is an employee of Astra Zeneca. LHF and CM are employees of Fresenius Medical Care Renal Therapies Group. The authors report no other conflicts of interest in this work. Block GA, Hulbert-Shearon TE, Levin NW, Port FK. Association of serum phosphorus and calcium x phosphate product with mortality risk in chronic hemodialysis patients: a national study. Am J Kidney Dis. 1998;31(4):607–617. Block GA, Klassen PS, Lazarus JM, Ofsthun N, Lowrie EG, Chertow GM. Mineral metabolism, mortality, and morbidity in maintenance hemodialysis. J Am Soc Nephrol. 2004;15(8):2208–2218. Lertdumrongluk P, Rhee CM, Park J, et al. Association of serum phosphorus concentration with mortality in elderly and nonelderly hemodialysis patients. J Ren Nutr. 2013;23(6):411–421. Tentori F, Blayney MJ, Albert JM, et al. Mortality risk for dialysis patients with different levels of serum calcium, phosphorus, and PTH: the Dialysis Outcomes and Practice Patterns Study (DOPPS). Am J Kidney Dis. 2008;52(3):519–530. Fissell RB, Karaboyas A, Bieber BA, et al. Phosphate binder pill burden, patient-reported non-adherence, and mineral bone disorder markers: findings from the DOPPS. Hemodial Int. 2016;20(1):38–49. Covic A, Rastogi A. Hyperphosphatemia in patients with ESRD: assessing the current evidence linking outcomes with treatment adherence. BMC Nephrol. 2013;14:153. Wang S, Alfieri T, Ramakrishnan K, Braunhofer P, Newsome BA. Serum phosphorus levels and pill burden are inversely associated with adherence in patients on hemodialysis. Nephrol Dial Transplant. 2014;29(11):2092–2099. Floege J, Covic AC, Ketteler M, et al. A phase III study of the efficacy and safety of a novel iron-based phosphate binder in dialysis patients. Kidney Int. 2014;86(3):638–647. Floege J, Covic AC, Ketteler M, et al. Long-term effects of the iron-based phosphate binder, sucroferric oxyhydroxide, in dialysis patients. Nephrol Dial Transplant. 2015;30(6):1037–1046. Coyne DW, Ficociello LH, Parameswaran V, et al. Real-world effectiveness of sucroferric oxyhydroxide in patients on chronic hemodialysis: a retrospective analysis of pharmacy data. Clin Nephrol. 2017;88(8):59–67. Kalantar-Zadeh K, Parameswaran V, Ficociello LH, et al. Real-world scenario improvements in serum phosphorus levels and pill burden in peritoneal dialysis patients treated with sucroferric oxyhydroxide. Am J Nephrol. 2018;47(3):153–161. Saran R, Robinson B, Abbott KC, et al. US Renal Data System 2017 annual data report: epidemiology of kidney disease in the United States. Am J Kidney Dis. 2018;71(3):S1–S676. Vaziri ND. Safety issues in iron treatment in CKD. Semin Nephrol. 2016;36(2):112–118. Notes: aTo protect patient privacy, censoring events counts ≤10 cannot be reported. bAfter SO initiation and exhaustion of the original supply of first-line non-SO binder. Abbreviations: LDO, large dialysis organization; SO, sucroferric oxyhydroxide. Notes: Secondary, intention-to-treat analysis of serum phosphorus control outcomes was performed as for primary analysis but patients were censored from the analysis only upon loss to follow-up (death, transfer of care, transplant, withdrawal from dialysis, disenrollment from large dialysis organization pharmacy), or change in dialysis modality. Discontinuation of sucroferric oxyhydroxide or receipt of a prescription fill for a non-SO binder was not considered to be censoring events in intention to treat analyses. Abbreviations: ICHD, in-center hemodialysis; SO, sucroferric oxyhydroxide.